A prolonged heavy lake effect snow event took place off of Lake Ontario and Lake Erie December 25-26 2017. By the morning of the 26th, up to two feet of snow had already been reported in some areas of New York state just off the lakes. Up to an additional couple feet of snow was forecast through the morning of the 27th. To support forecasters during the event, GOES-16 1-min imagery was requested over the region. The high spatial resolution visible 1-min imagery from GOES-16 allows forecasters to precisely track the evolution of the narrow convective snow bands both in space and time (Figure 1). As of 2100 UTC today (12/18/2017), GOES-16 is the official operational GOES-East satellite, stationed at 75.2W. Imagery no longer requires the “preliminary, non-operational data” caveat! GOES-13 (old GOES-East) will stop transmitting data between 1530-1545 UTC on Jan 3. Tip for those who are wanting to quickly and easily revive existing procedures or perspectives containing GOES-16 data. When loading these procedures/perspectives since GOES-16 data returned on 12/14 in the GOES-East position, GOES-16 data will not load. This is because GOES-16 data is now accessed through the “GOES-16” > “Imagery/Derived/Diff/RGB” > “East FD/CONUS/Meso” menus instead of from “Center“. You could go through and manually reload the imagery/products from the correct menu and save the procedure/perspective. Alternatively and quicker, you could load and edit the xml file(s) associated with your GOES-16 containing procedure perspectives. Simply replace all instances of TFD with EFD, TCONUS with ECONUS, and TMESO with EMESO and save the .xml. Your ITO or SOO should be able to show you where to find these files. For fun, below is 1-min visible imagery of mountain wave clouds over the Pennsylvania Appalachians from this morning. Recent snowfall across the region is also diagnosed. GOES-16 arrived safely at the GOES-East position (75.2W) on Dec 11, and dataflow resumed, including to NWS AWIPS, early on Dec 14. 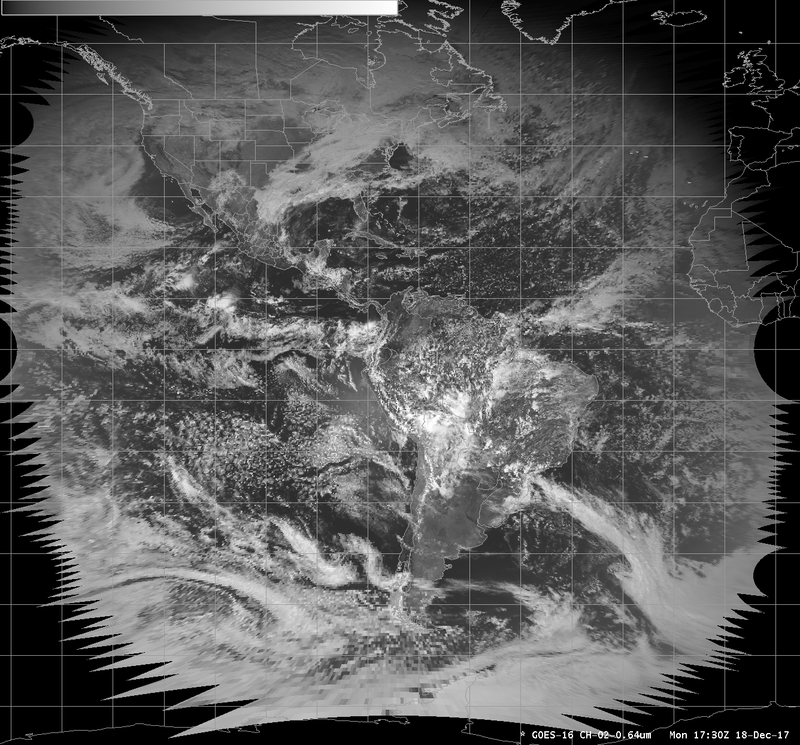 In AWIPS, GOES-16 data can be accessed from the “East Full Disk/CONUS/Mesoscale” sub-menus in the GOES-16 menu. Forecaster procedures that include GOES-16 products and imagery will need to be updated. Offices may resume requesting Mesoscale Domain Sectors (MDS) of 1-min and 30-sec imagery. 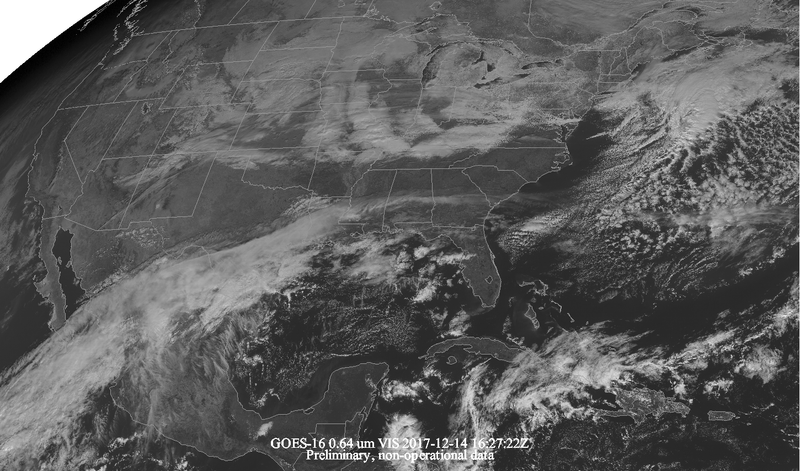 The CONUS sector from GOES-16 as GOES-East is visualized in Figure 1. GOES-16 has not yet been declared the operational GOES-East satellite, so the “preliminary, non-operational” tag is still necessary. This designation is expected to occur by Dec 20. GOES-13 will remain at the GOES-East position (75W) and data flowing into AWIPS until Jan 3. GOES-13 will reach its storage location at 60W on Jan 22.